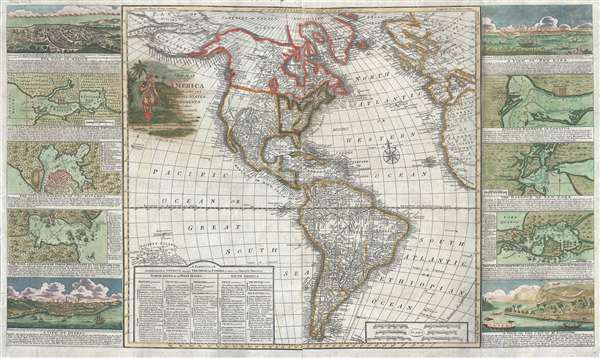 Only know example of George Thompson's 1799 broadside map of the Americas. An exceptionally rare separately issued 1799 broadside map of America by the English printer and mapmaker George Thompson. Thompson's map covers the Americas from the Arctic Circle (Arctic Land) to Tierra de Fuego and Cape Horn. It extends westward into the Pacific as far as Hawaii (Sandwich Islands) and the Marquesas, and eastward to including most of the Atlantic Ocean as well as parts of Europe and Africa. A large inset table in the lower left identifies colonial possessions in the Americas. To the left and right of the map proper, Thompson has added side panels featuring ten maps and views, including Mexico City, Halifax, Havana, Portobello, Quebec City, New York City, Kingston Harbor (Jamaica), New York Harbor, Cartagena, and San Salvador (Brazil). The maps and views presented in the side panels stylistically resemble maps of the early 18th century, but we have been unable to isolate specific sources. The mythic cities of gold, Teguayo and Quivara, are identified to the west and north of the Colorado River. Teguayo was fictional city in the American west thought to house great wealth, but was in fact a confidence scam perpetrated by the Spanish scoundrel and self-proclaimed count, Don Diego Dionisio de Peñalosa. Quivara was an actual American Indian settlement in the Mississippi River Valley sought after by Hernando Coronado, but here for no clear reason it has been relocated to the far north, near the Oregon River. Thompson was not specifically a map publisher but he was a prosperous printer. He most likely issued this map to capitalize on general interest in the rapidly changing political situation in America. Following the victory of the United States at the end of the American Revolutionary War, European colonization of American began to degrade. Within 10 years of this map's issue France would sell Louisiana to Jefferson, Spanish hegemony in Latin America would begin to degrade, and the British colonial hold would begin to falter elsewhere. This map is rare. We have been able to isolate only a single obscure reference to it in an 1814 publication of the New York Historical Society. We have identified a single example of this map in an updated 1813 edition held at Princeton University. The present example is mostly likely the only example in private hands, and possibly the only known surviving example. George Thompson (June 17, 1758 – February 15, 1826) was a British stationer, printer, and map publisher active in London in the late 18th and early 19th century. Thompson was born in London, the son of a butcher. He apprenticed with William Morgan of the Stationers Guild in 1773. Thompson produced few maps, all of which were separately issued broadsides. Around 1798 – 1799 he appears to have issued a series of large format broadside map of the world and continents. All George Thompson maps are extremely rare today. Thompson was succeeded by his son, George Nathaniel Thompson, after his death in 1834. Although Thompson published few maps, the size of his fortune at death, nearly 70,000 GPB suggests that he was a highly successful printer and stationer. Very good. Backed with arhival tissue. Issued on two panels joined by publisher.